Takabisha, a Gerstlauer Euro-Fighter steel roller coaster located at the Fuji-Q Highland theme park in Fujiyoshida, Yamanashi, Japan, has a free falling angle of 121 degrees. The ride was officially opened to the public on July 16, 2011. The 1,000-metre (3,300 ft) ride begins with a sudden drop into pitch black darkness before entering a slow heart line roll. The whole ride gets over in just 2 minutes. 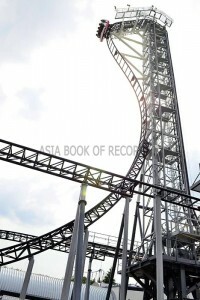 Comments for STEEPEST ROLLER COASTER are now closed.